Arsenal defender Sokratis Papastathopoulos really got his side out of trouble against Newcastle today. 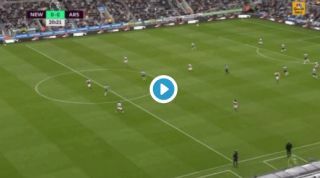 A terrible slip from Shkodran Mustafi allowed Newcastle a clear run at the Gunners goal, but Sokratis was on it in a flash to make an absolutely fantastic recovery. The Greece international joined the club from Borussia Dortmund in the summer and looks a very solid addition to the side. Sokratis showed his pace and experience here to get back quickly but not dive into a challenge, simply forcing his opponent wide and killing what could’ve been a big, big chance for the home side.